Since the Fukushima disaster in Japan, ensuring the salmon (and other seafood) is safe has been an ongoing concern. Ocean currents that are move around the radioactive water from Japan. Here are the salmon migration routes, published by the U.S. Fish and Wildlife Service. Here is the original PDF file from fws.gov. Here is the ocean currents map from the National Weather Service. Needless to say that the migration routes of the salmon do cross the Kuroshio current that follows the coast of Japan. As per July 2013, radioactive water is still leaking into the Pacific ocean. Based on the leak history, Norwegian Environmental and Remote Sensing Center predicts that the radioactive spill will cross the pacific ocean and reach the west coast of US by 2015. Click to view the animation. 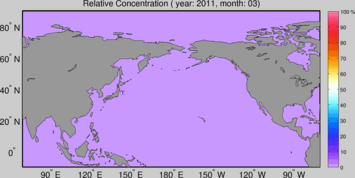 Maximum concentration propagates eastward in the Pacific toward the United States during a 7-year period while the total concentration drops to 1-2% of the source concentration (100%) after 5 years. Note #1. Some additional information on this topic from the European Union’s EUROPEAN COMMISSION / HEALTH & CONSUMERS DIRECTORATE. Is this supposed to make people feel safe? How about the non-smokers? Per this news article, the radiation levels in the fish caught on the west coast in February 2013 is elevated. Anyone wants to have a smoke? Note #2. Alaska’s Division of Environmental health has a page on the radiation pollution from Fukushima, which shows that Salmon doesn’t go too far away from the Alaska coast. Upon more thorough inspection, it turned out that the content of that page is taken from Alaska’s Seafood Marketing Institute. A brief visit to their web site shows that it is a marketing organization with the mission of increasing the economic value of the Alaska seafood. Skip and ignore! Despite all of the above, the official position of the USDA & EPA is that Pacific/Alaskan seafood is safe. Make up your own mind. A post about the Atlantic Salmon is coming soon.